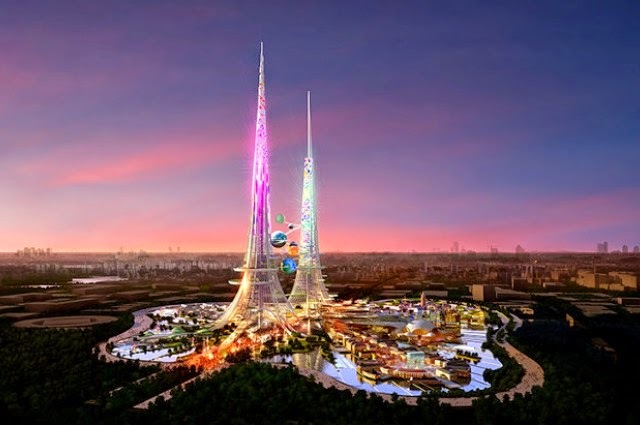 Two towers nearly a kilometer high has been declared for Wuhan, China. But they won't just be unusual just because of their height; the towers will essentially clean the unclean lake next to which they will stand. At 830m high the Burj Khalifa has been the world's highest structure since 2010. UK designers Chetwoods are offering to go for the full 1000m. 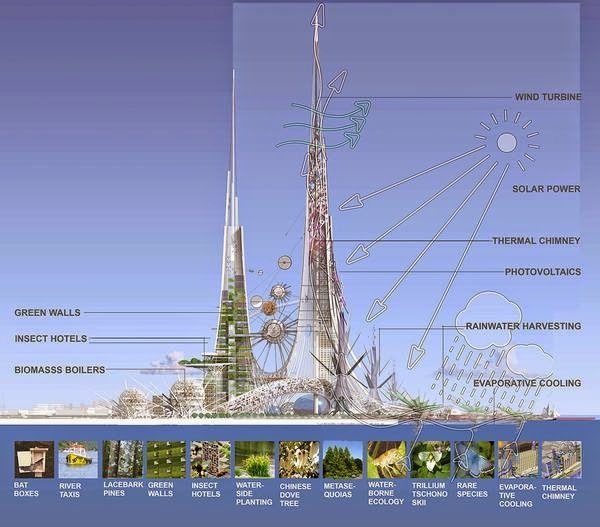 Tall structures need a lot of power, mainly for lifts, but Adele Peters of business magazine Fast Company says “Wind turbines, lightweight solar cladding, and hydrogen fuel cells running on the buildings’ waste will generate all of the power used by the towers, plus a little extra for the rest of the neighbourhood.” Furthermore, the engineers suggest to wrestle Wuhan's notorious pollution. Peters says "The towers also have pollution-absorbing coatings to help clean the air, vertical gardens that filter more pollution, and a chimney in the middle of the larger tower naturally pulls air across the lake for better ventilation,” Architect Laurie Chetwood explains “The water goes up through a series of filters. We don’t use power to pull the water up, we’re using passive energy. As it goes through the filters and back, we’re also putting air back into the lake to make it healthier.” Only the higher tower will have a wind turbine, letting it to not only meet its own energy requirements, but resource power to the other tower too. The timelines for the task are amazingly tight, with construction planned to start this year (in spite of mayor support still being compulsory) and completion in 2017 or 2018. By contrast the Burj Khalifa acquired six years to construct from first dig.